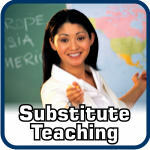 Click here to learn how to become a Substitute Teacher. Familiarize yourself with all of the school sites within the district in which you are registered as a substitute teacher. When Frontline for Education or a person contacts you to substitute, respond affirmatively to calls, if possible. In all cases, answer the phone – even if you are unable to work that day. If you need to decline the job just say so. Substitutes are required to arrive on time and remain in the building until the end of the work day as listed in Frontline for Education for that assignment. Arriving late or leaving from an assignment could result in a reduction of pay and/or one's removal from the Frontline for Education system. Dress for respect – professionally. This will let your students know that you consider your job to be professional. All substitute staff members are expected to serve as role models for students and co-workers with regard to dress and grooming. Men: Business Casual dress is appropriate for substitute teaching, (i.e., a pair of well pressed slacks and a button down shirt or a golf shirt). Avoid collarless shirts and jeans unless you are notified otherwise. Women: Slacks suits are very good for substitute teaching, particularly if you are serving young children. It is helpful to wear something with pockets. In addition wear clothes you can bend over in (i.e., no short skirts or low-cut blouses). Be sure to wear comfortable shoes – substitute teachers spend a lot of time on their feet. Be familiar with the location of the school before you leave for an assignment. School district websites usually provide maps and/or directions to schools. Most assignments on Frontline for Education feature maps and directions using www.mapquest.com. Arrive early. Give yourself at least 30 minutes (if possible) to get acclimated to your classroom and the day’s schedule. Upon arrival, report to the main office. Introduce yourself and state you are there as a substitute and mention the type of classroom you are assigned to or the name of the teacher who is absent. Follow the school’s reporting/sign-in procedure. Find out how to report students who are tardy or absent. Ask about student passes and special procedures. Get the names of the principal, secretary, and the teachers who teach in neighboring classes. Know who you can go to for answers to your questions, and especially who to contact in an emergency. Read through the lesson plans. Always try to follow the lesson plans. If no lesson plan is available, utilize your emergency lesson plans that you’ve prepared. Alternatively, contact the neighboring teacher or principal for assistance. If there is a seating chart, review it and put it where you can refer to it throughout the day. If there is no seating chart, draw your own. Review any material that is unfamiliar. If needed, find another teacher who can explain it to you. Look for the class expectations or rules. These may be posted on a wall. If they are not posted on a wall, write them on the board. If there are no class rules or expectations posted, post your own basic rules on the board. Be aware of fire and emergency weather procedures. If there is a drill during your time as substitute teacher, be sure to account for all students in your assigned class. If you are in doubt about anything, ask a neighboring teacher or an administrator. When it is time for students to enter the classroom, greet them at the door. This will set the tone for your time with them. Introduce yourself and explain that your goal is to help the students achieve the goals set by the regular classroom teacher. Explain what the class will be doing during the day (or class period). This will help reduce student anxiety. Take classroom attendance. If appropriate, report it according to school procedures. Take the lunch count, if needed. Begin learning activities as soon as possible. The sooner students are engaged in their studies, the less time they will have to misbehave. Teach the lessons described in the lesson plan provided by the regular teacher. This is a must! Call students by name. Use a seating chart to identify and call on students. This promotes rapport with students. It is also an effective classroom management tool. While teaching, walk around the room. Proximity is often an effective way to maintain classroom control and to keep students on task. Give fill-in activities to students to do when their assigned work is done. Such activities can serve as rewards for staying on task to complete assignments. For example, puzzles, mazes, and brain teasers help students develop their problem-solving skills. Word searches and crossword puzzles help students practice vocabulary. Stay until the end of the school day. Refer to the detailed start/end times for each school that are included in your packet. At the end of each class or day, have students straighten up and clean the area around their desks. After dismissing students for the day, write a note for the teacher summarizing the classroom activities, assignments, and offer any comments. Be sure to include positive, as well as negative, information. Grade handed-in papers if grading instructions were given or if grading strategy is clear. Stack handed-in papers neatly and put them in a place where they’ll be easily found. Put away all books where they were when you arrived. Be sure the room appears orderly and in the same (or better) condition as when you arrived. Stop into the office to sign out and return any keys.